Based on the concept of "Enjoyment", "Learning", and "Using", learn the basic knowledge of disaster preparedness, including useful contents appropriate in the case of an emergency disaster. 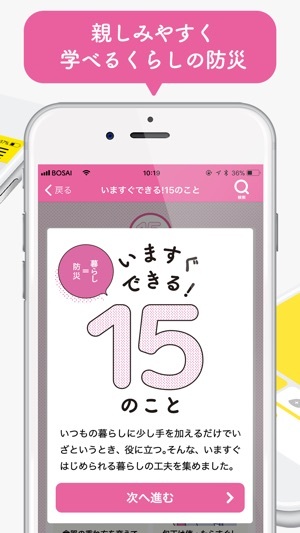 Application has three modes including, "Disaster Preparedness Tokyo", "Disaster Readiness Guide", and "Disaster mode". A much-valued disaster preparedness application. By using these modes appropriately, you will gain the disaster preparedness knowledge useful in a real emergency. 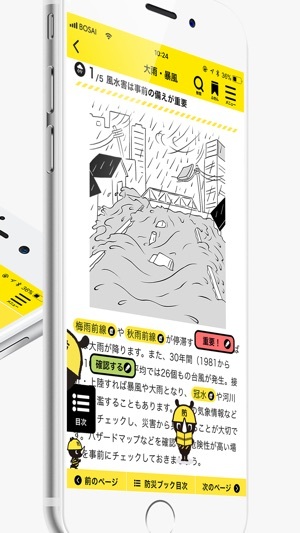 This mode teaches you basic disaster prevention facts and actions to take in a disaster. 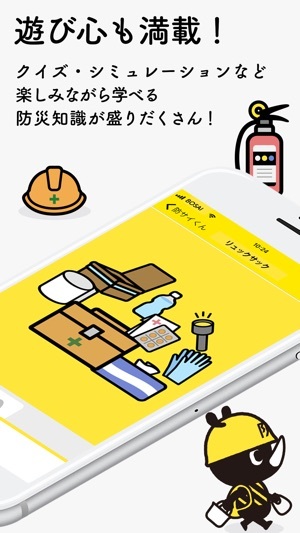 This mode teaches disaster prevention measures you can take in day-to-day life. Includes useful features for safety confirmation and disaster map. A safety mode during a real crisis. 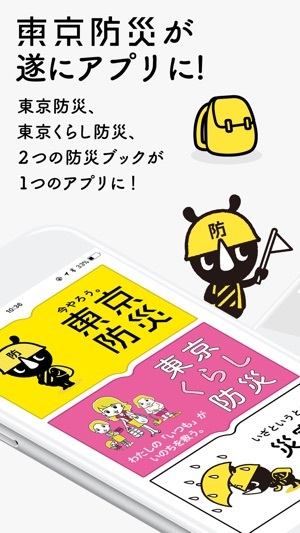 ● Browse and search the "Disaster Preparedness Tokyo" and "Disaster Readiness Guide"
Browse the "Disaster Preparedness Tokyo" and "Disaster Readiness Guide" using your smartphone. You can easily retrieve the information you need and also supports in offline mode. ● "Bosai the Rhino's House"
"Bosai the Rhino's House" resembles the disaster preparedness. The more you use the application and learn about disaster preparedness, you will collect disaster preparedness items while having fun. Learn and enjoy about disaster prevention through various kinds of quizzes. Learn about what actions to take in emergency through mock scenario. Feature to checklist preparation for food and indoor items. Input expiration date and notes for each item. In addition to a regional risk map that lets you confirm the current location, as well as, the risk level, disaster prevention facilities, and emergency station for commuters during a crisis are published. Even in the off-line mode, it will assist you to your destination. When tapping, an alarm will sound, location-based information will be sent to friends and family members registered before-hand. This functionality is available for both emergency and non-emergency situations. 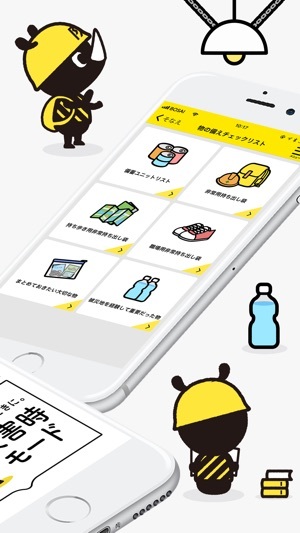 You can check for Evacuation, Weather, Earthquake, Tsunami, and Volcano information in the Tokyo Metropolitan area, as well as, the area registered by yourself. Assist with safety confirmation of friends and family members, through cross-sectional information search using various kinds of services. 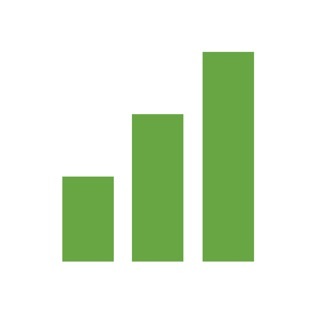 In addition to linkage with "Disaster Preparedness Tokyo" Twitter, important tweets will be push notified. Even in the event of an emergency, you will be able to catch the latest update from Tokyo Metropolitan Government without missing out. 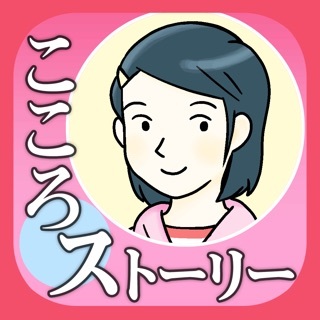 Copyright © 2019 TOKYO METROPOLITAN GOVERNMENT All rights Reserved.